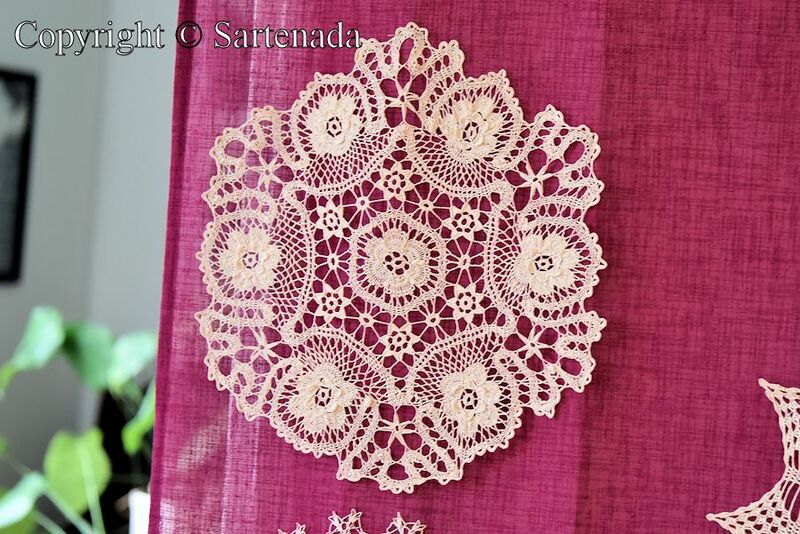 Hooked on lace – Part 1. 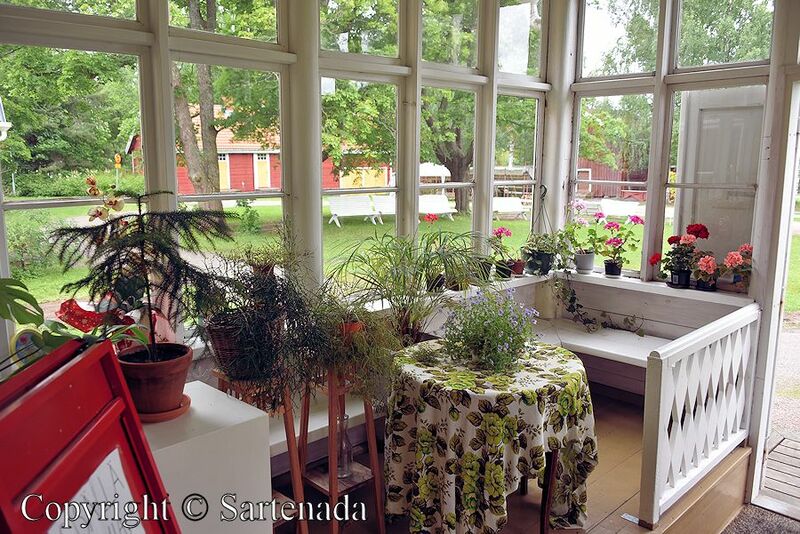 It was in summer 2016, when we visited to old vicarage, called Kulttuuripappila Sylvi (1804), in Pieksämäki. The distance between Helsinki and Pieksämäki is 306km / 190mi. Why we drove to Pieksämäki? 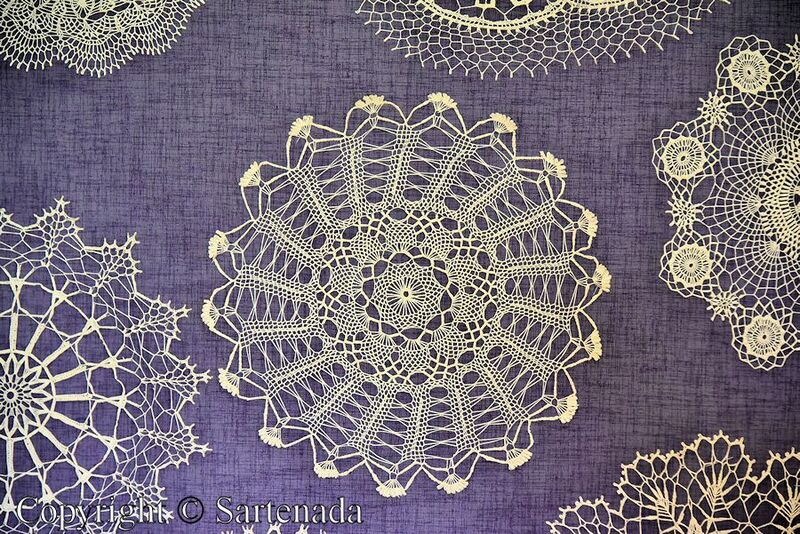 Well, there was very interesting, maybe unique exhibition of laces. 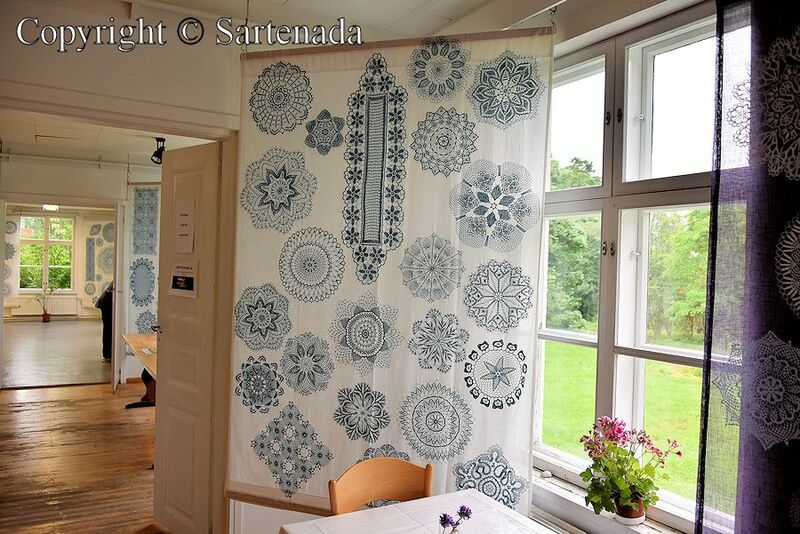 Lady Silja Keränen inherited a big amount crocheting yarns from her mother in 2008. After thinking for a while what to do with them, she decided to crochet. Wise decision! 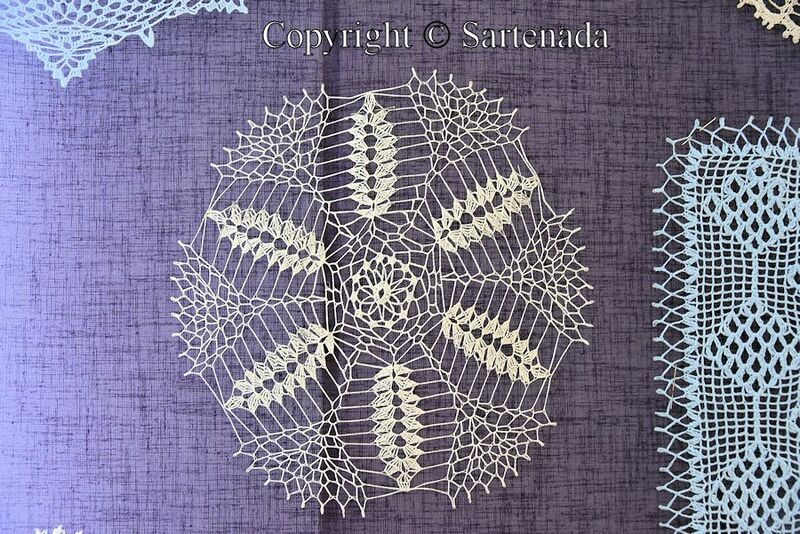 Models Silja searched from Internet and she crocheted the majority of them from photos. 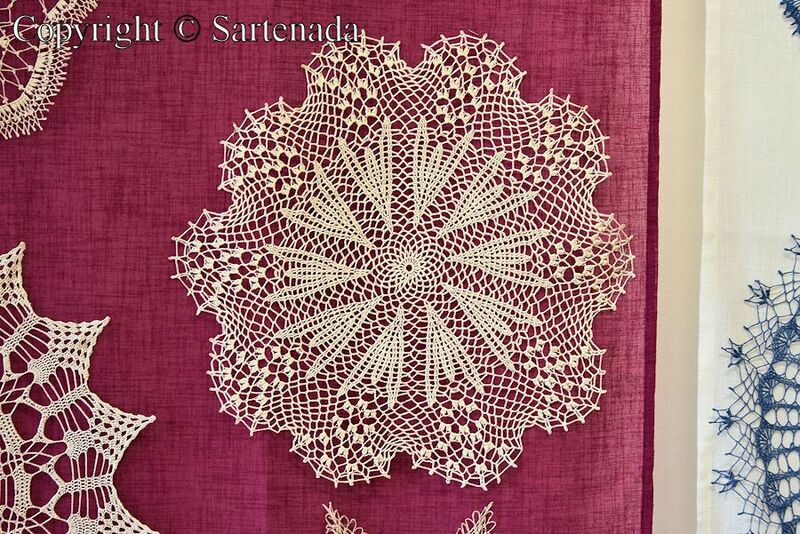 Until now, she has crocheted more than 450 crochets and in the exhibition, there were about 400 crochets. Think about it. Enganchado en encaje – Parte 1. Fue en el verano de 2016, cuando visitábamos a la antigua vicaría, llamado Kulttuuri Pappila Sylvi (de 1804), en Pieksämäki. La distancia entre Helsinki y Pieksämäki es 306 kilometros / 190 millas. ¿Por qué nos manejábamos a Pieksämäki? Bueno, allí era una exposición muy interesante, tal vez una exposición única de encajes. Señora Silja Keränen heredó una gran cantidad de hilos de encajos de su madre en 2008. Después de pensar un ratito qué hacer con ellos, decidió hacer encajes. ¡Decisión sabia! Modelos Silja buscó desde Internet y la mayoría de las encajes ella hizó a partir de fotos. Hasta ahora, ella ha hecho más de 450 encajes y en la exposición, había alrededor de 400 encajes. ¡Piénsalo! ¡Disfruta de estos manteles de encaje! Accroché sur la dentelle – Partie 1. Il était en été 2016, quand nous avons visité à l’ancien presbytère, appelé Kulttuuripappila Sylvi (1804), en Pieksämäki. La distance entre Helsinki et Pieksämäki est 306 km / 190mi. Pourquoi nous sommes allés à Pieksamaki? Eh bien, il avait une très intéressant exposition, peut-être la unique exposition presentant de dentelles. 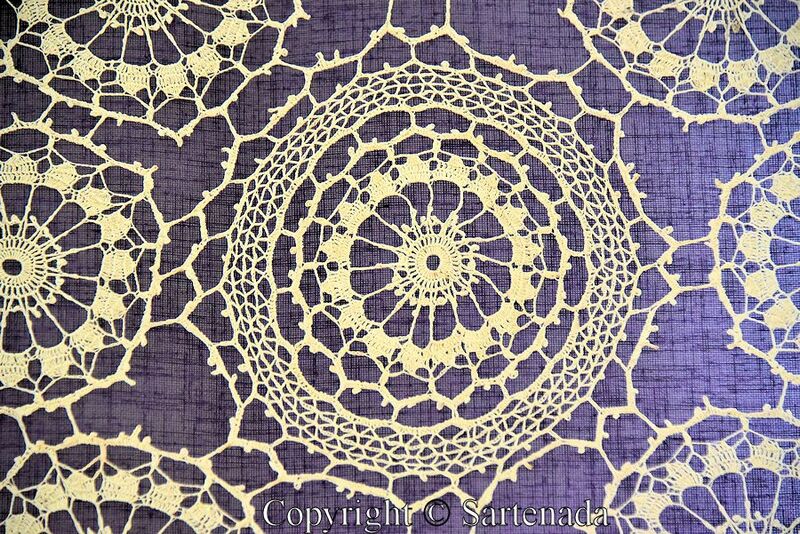 Madame Silja Keränen a hérité d’une grande quantité des fils de crochet de sa mère en 2008. 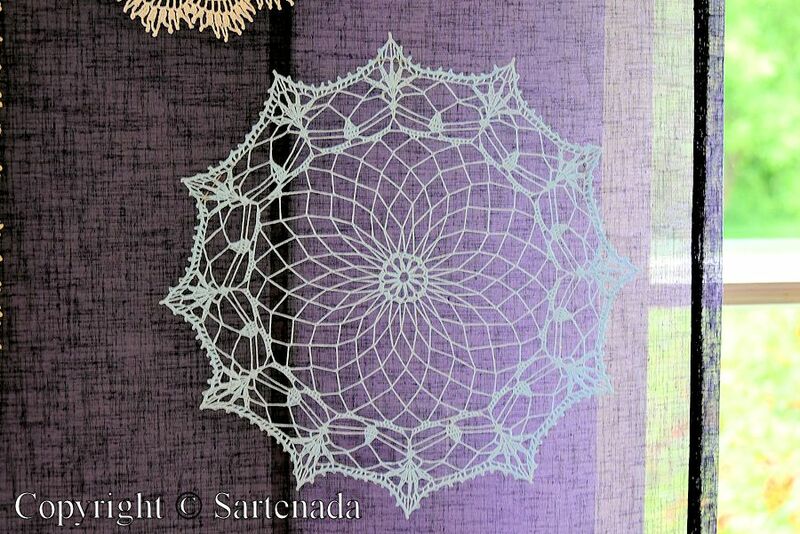 Après avoir réfléchi pendant un certain temps ce qu’elle faut faire avec ils elle décidait de faire du crochet. Sage décision! Modèles, Silja recherchait à partir d’Internet et la majorité, elle crochait d’entre elles à partir de photos. 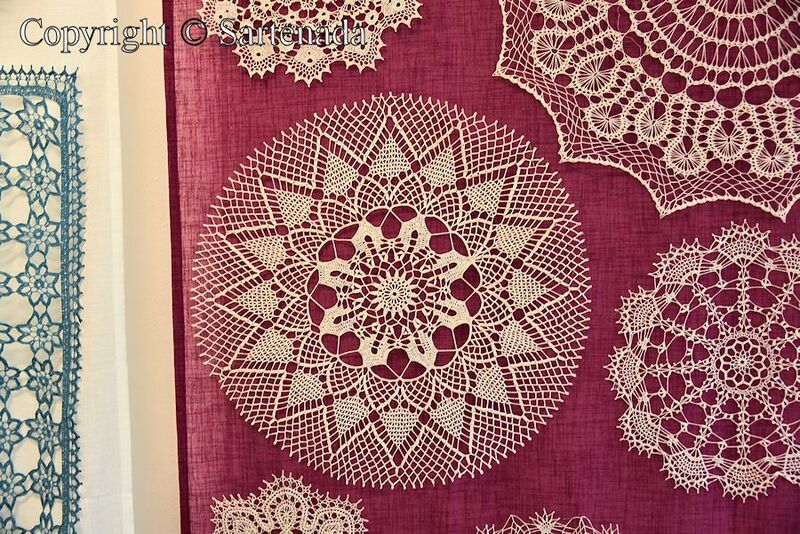 Jusqu’à présent, elle a croché plus de 450 crochets et dans l’exposition, il y avait environ 400 crochets. Penses-y. Profitez de ces napperons de dentelle! 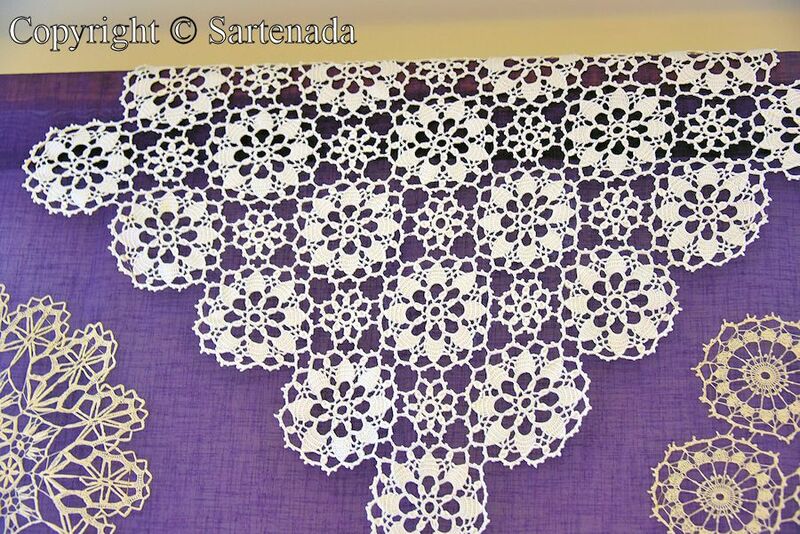 Enganchado na renda – Parte 1. 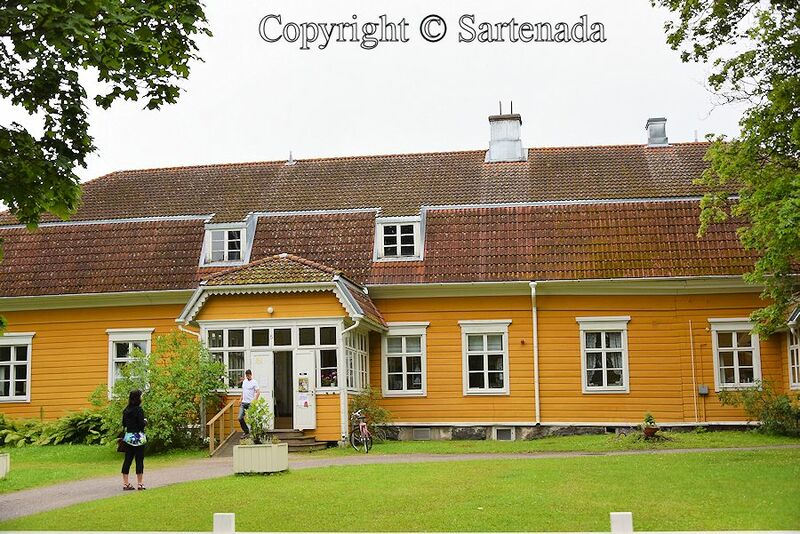 Foi no verão de 2016, quando visitou a velha paróquia chamado Kulttuuripappila Sylvi (1804), em Pieksämäki. A distância entre Helsínquia e Pieksämäki é 306 km / 190 mi. Por que nós dirigimos para Pieksamaki? Bem, la foi uma exposição muito interessante , talvez la única presentando rendas. La Sra Silja Keränen herdou um monte enorme de sua mãe fios de crochê em 2008. Depois de pensar por um tempo o que fazer com elas, ela decidiu fazer rendas. Decisão sábia! Modelos Silja buscou a partir de Internet e ela fez a maioria deles a partir de fotos. Até agora, ela fazia mais de 450 rendas e na exposição, havia cerca de 400 rendas. Pense nisso. 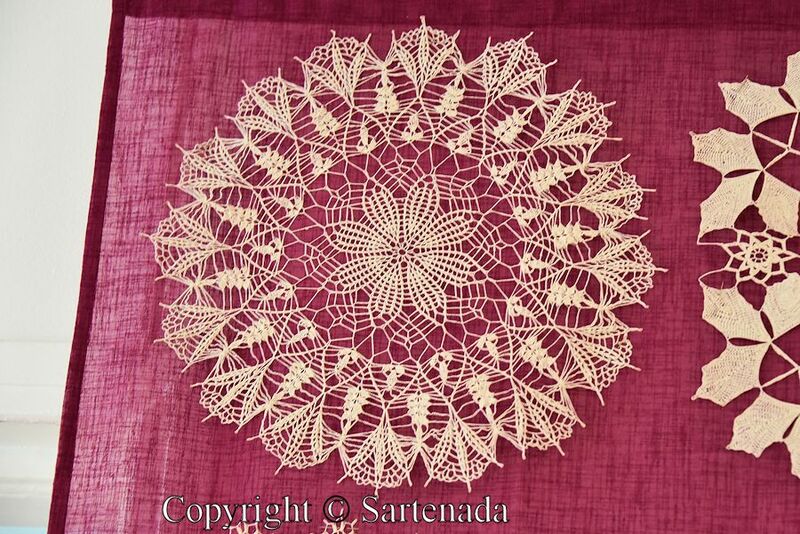 Aproveite estes doilies de renda! Crochet tractor / Tractor de ganchillo / Tracteur en crochet / Tractor de crochet . That’s a lot of work gone into making all those. You are right – lot of work and love for lacies. Thank You. That represents MANY hours of work. 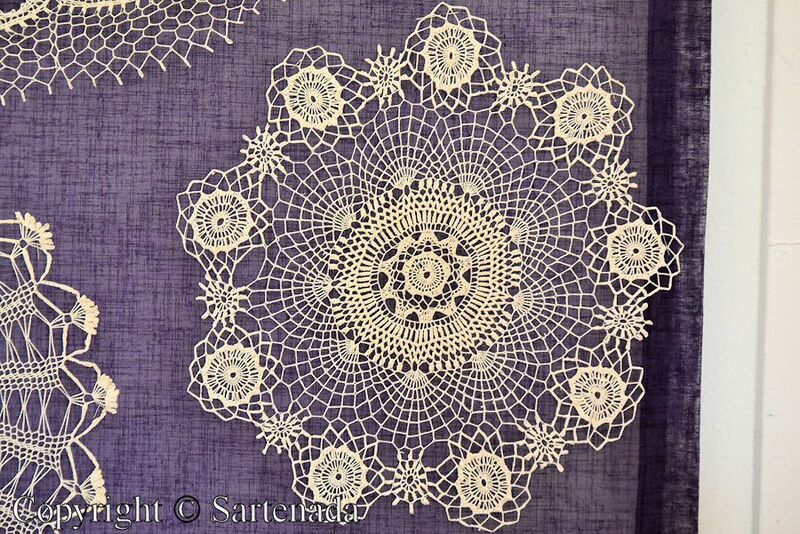 I am in awe of her patience and skill, they are very lovely. These are splendid works. You are worth going the distance of 306kms by car. J’apprécie beaucoup de votre commentaire. Merci. 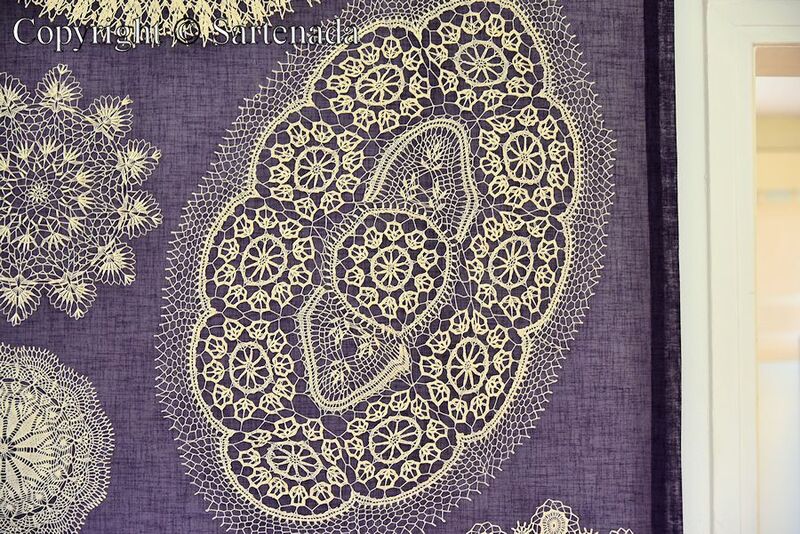 The lace is so intricate and with so much detail the mats must have taken a great deal of time to produce. 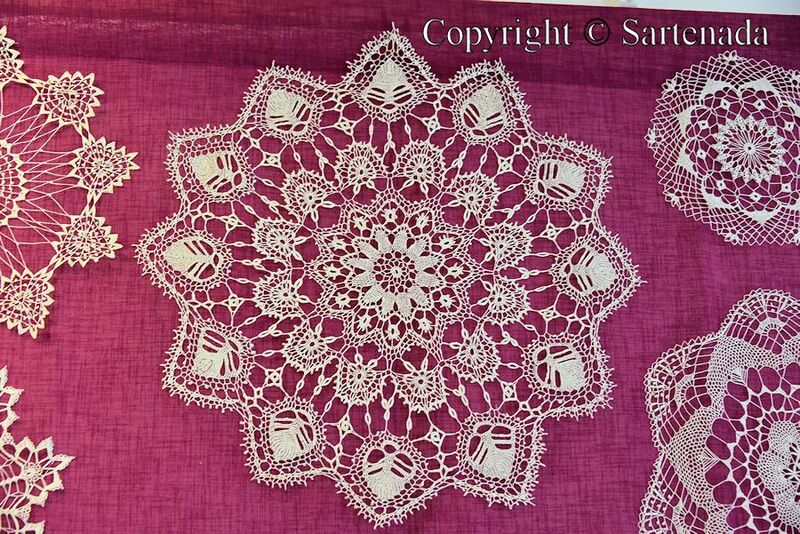 My mother and grandmother were often busy with their crochet hooks and I still have some of their delicate mats on dressing tables, etc. I’m sure the exhibition was worth the effort of driving so far and the building with its attractive porch is lovely, too. So typically Finnish. 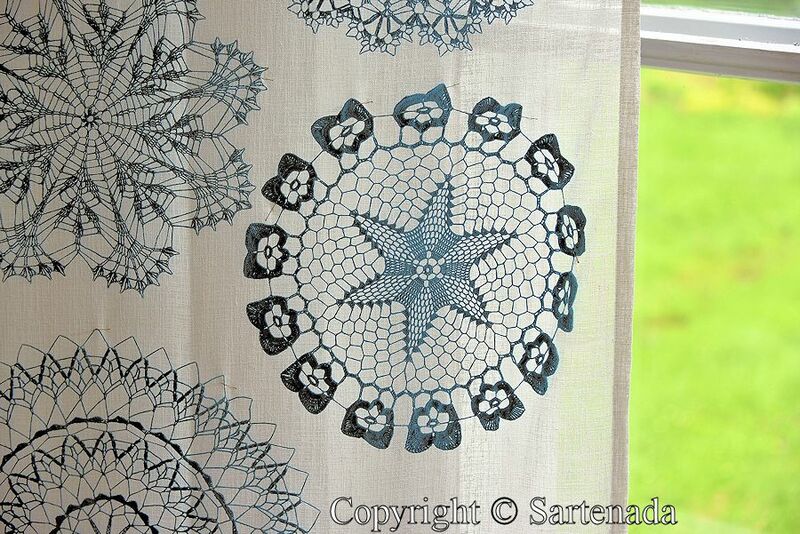 Thank you for a great post Matti!. 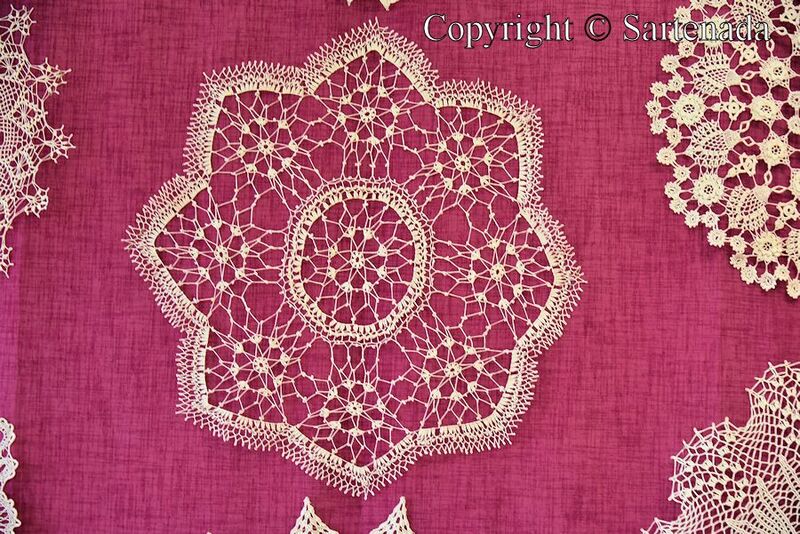 My late mother loved all kind of handicrafts and yet after years we have pink crocheted bedspread made by her in our bed. Last night we aired it out on a balcony and fluttered it before we made the bed. Thank You. 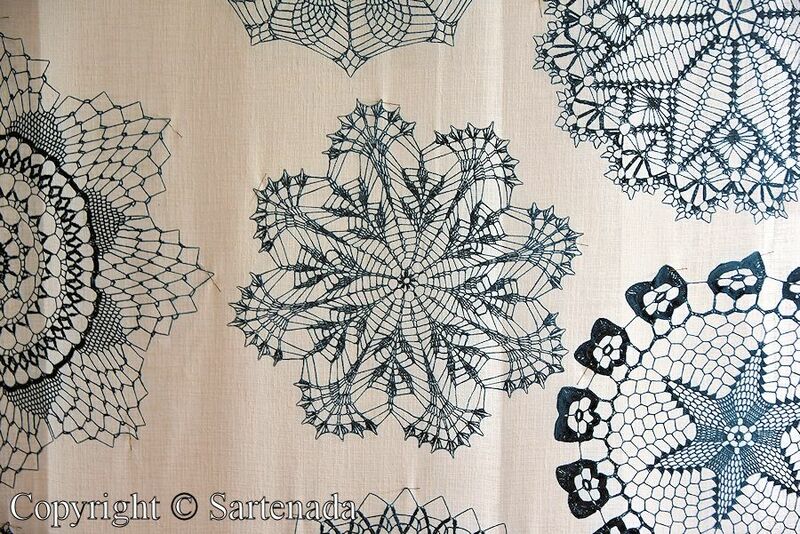 Fantastic patterns! I never knew there would be so many! I did not either. 🙂 Thank You. I appreciate Your comment very much. Although, I am man, I have learnt very much from these. Thank You Doda. 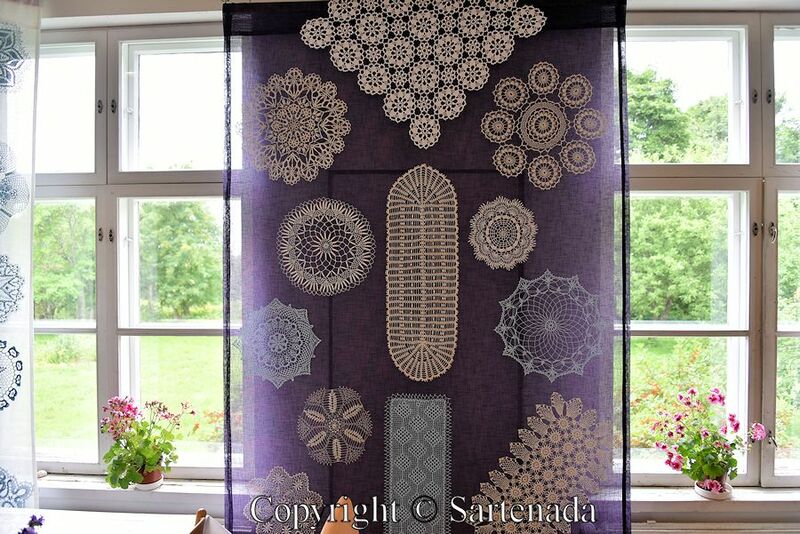 Yes,Matti,a man with refined tastes.Beautiful handwork should be appreciated by all of us,males and females.It’s sort of artwork.Enjoy your day,my friend! 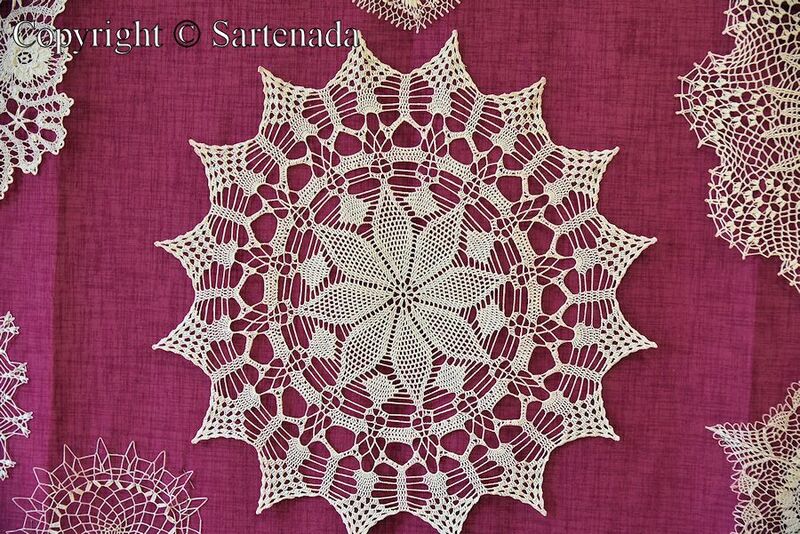 Great is crochet. 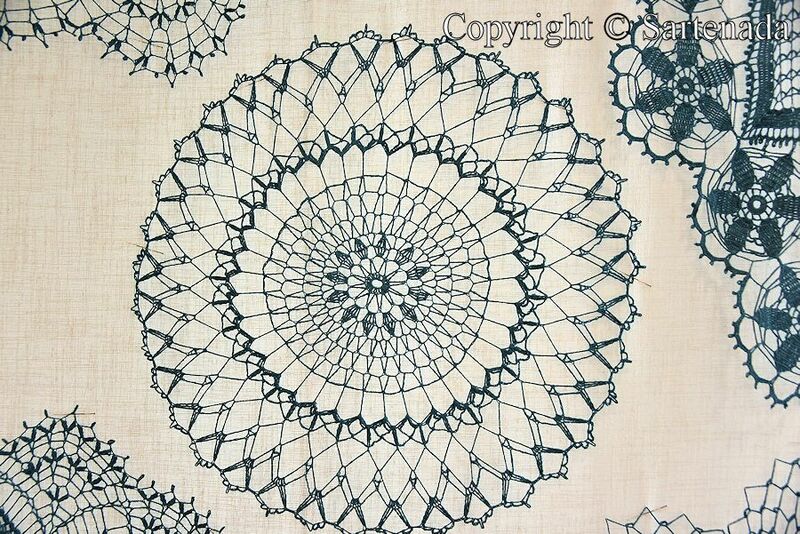 We admired the fineness of the pattern. 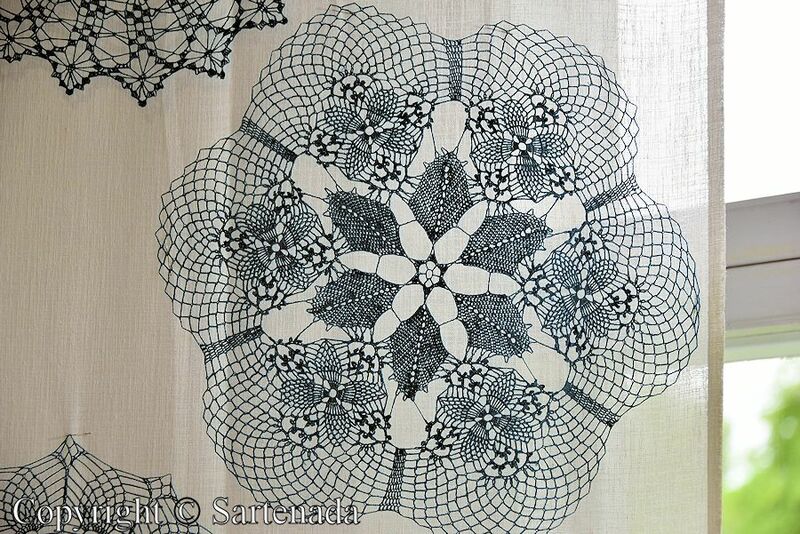 Threads she used were very thin and she created many kind of beautiful patterns. Thank You. 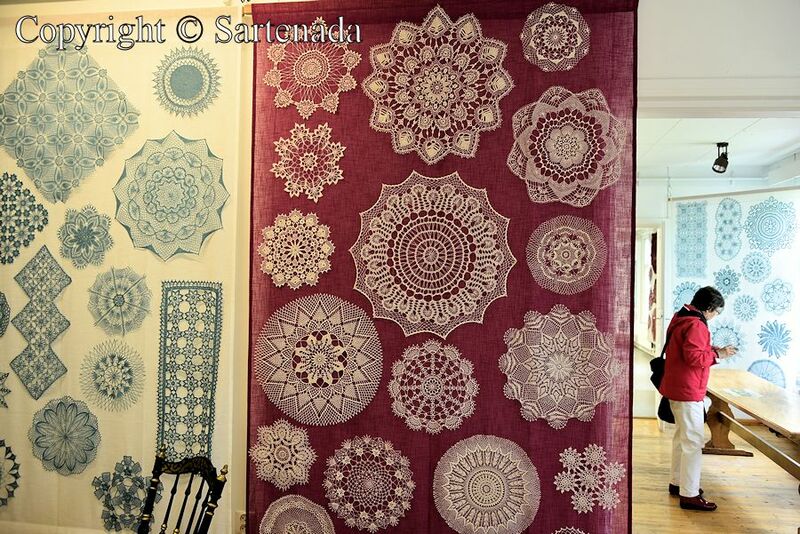 These are absolutely beautiful and they did a great job of displaying them, too! I would love to be able to watch her at work. Thank You. 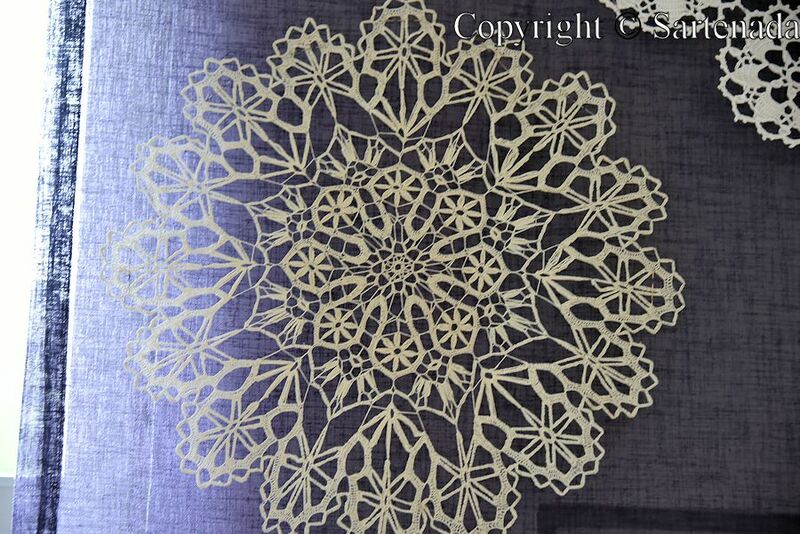 I searched video in which Silja talks, in Finnish, but also show how she makes and presents some of her laces. She is fast and relaxed in video. Thank you for the link! That’s amazing–she works so quickly and confidently. 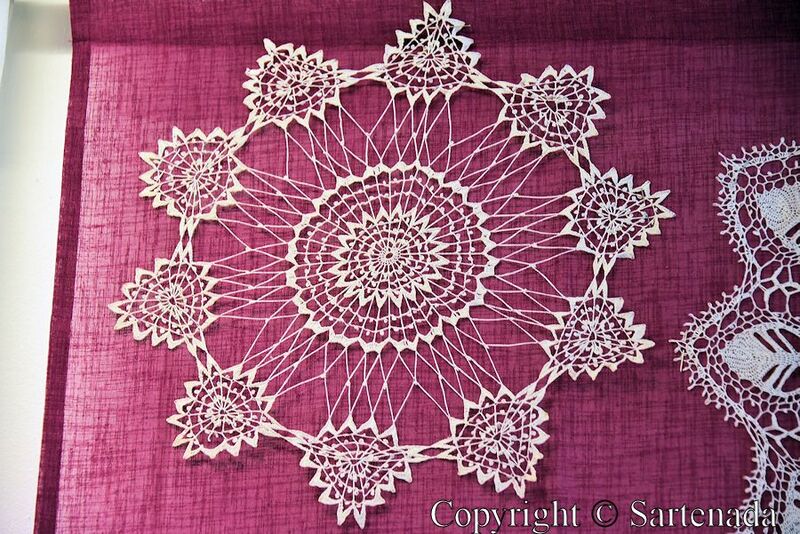 I can’t believe she can figure out what to do by looking at a finished doily. I am glad that You loved arcitecture also. Old historic wooden building. Thank You. 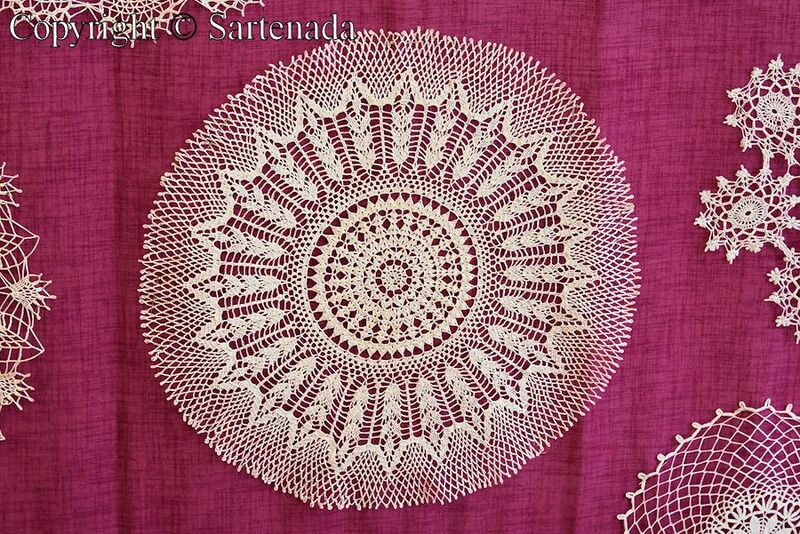 The doilies are so gorgeous! I liked how they were displayed. Thank You. I loved also how they were presented and it helped how to shoot photos from them. Wow! These pieces are absolutely beautiful. 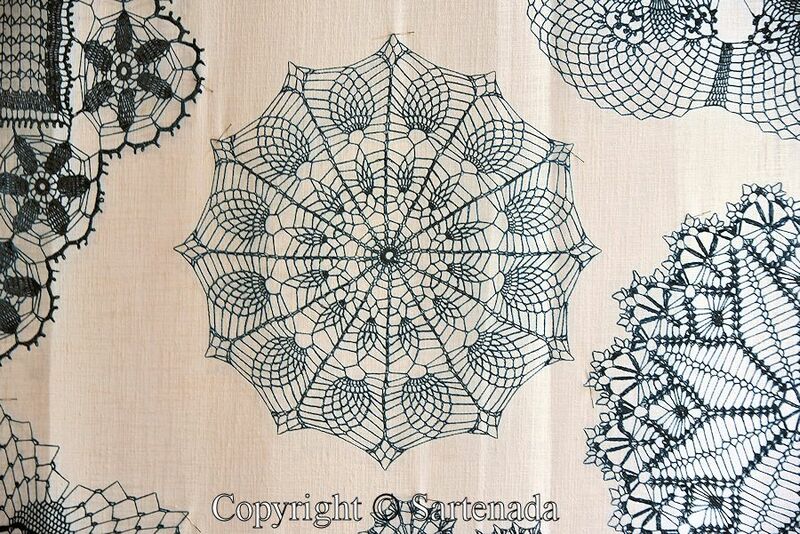 The designs are exquisite. It’s hard to imagine one woman doing all of these in a relatively short period of time. Your photos are wonderful. I am glad that You loved my post and appreciate Lady who made all these. Thank You. 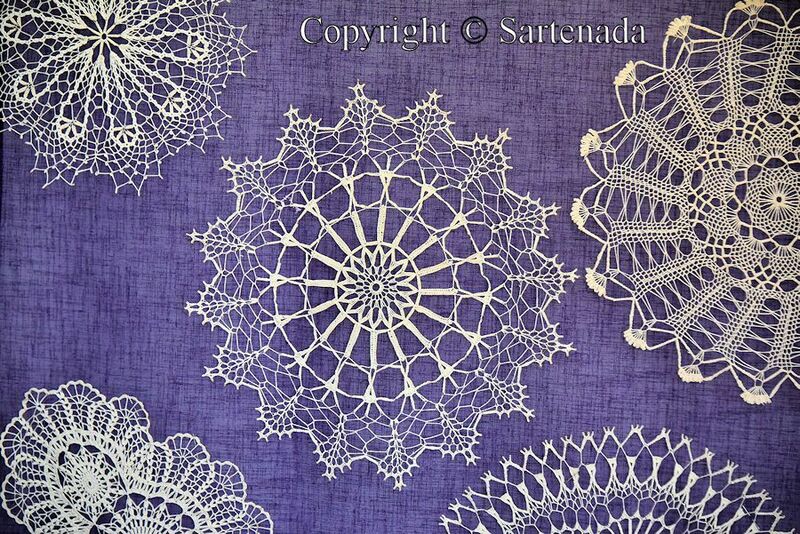 Rather beautiful these lace works! 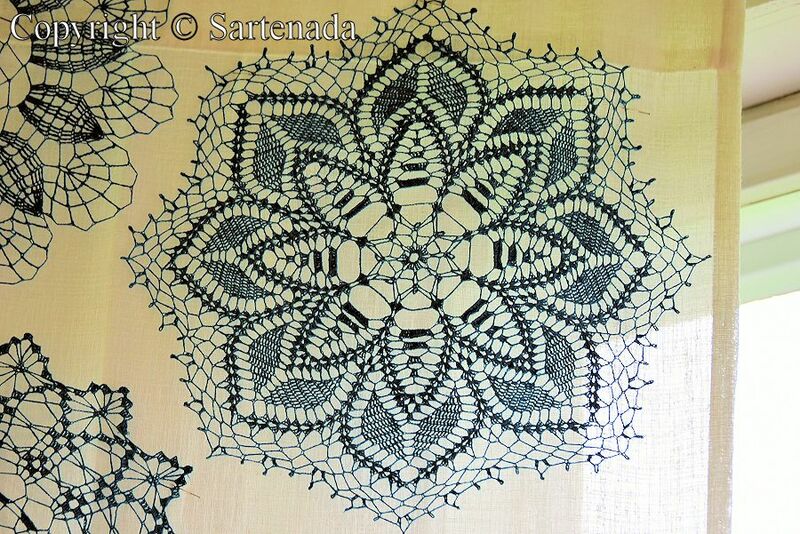 Extremly filigree and such a variety of patterns! 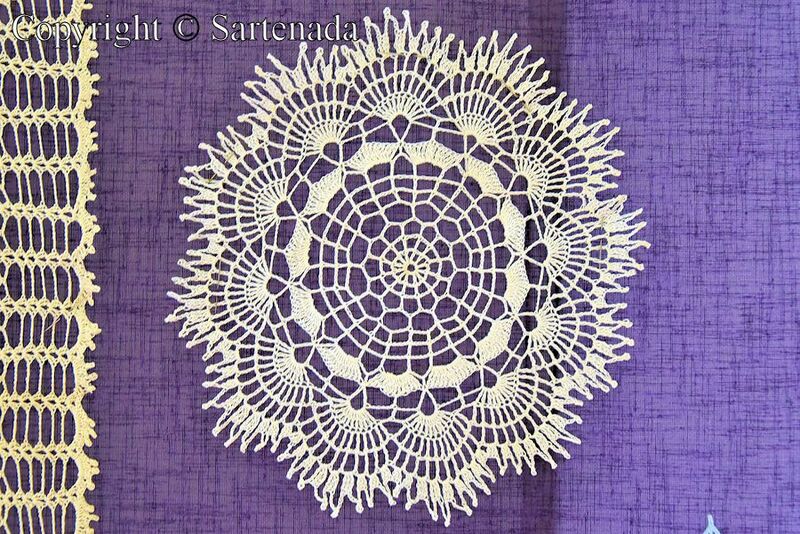 Some of them remind of snowflakes, other look a bit like a mandala and completely different appear those lace doilies that are composed of small and repeating basic patterns. 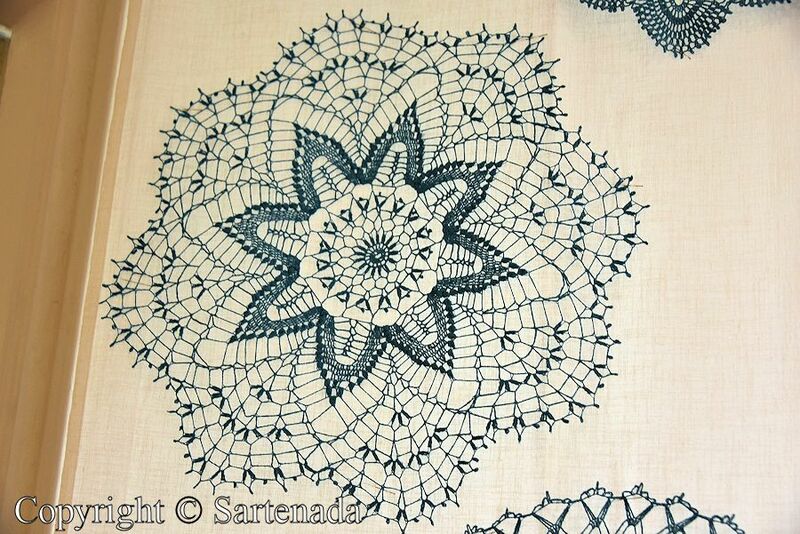 On the one hand doing such work must be relaxing and satisfying (seeing the result! ), but on the other hand it is physically demanding, too. Your eyes will become tired, your work posture is exhausting, your neck might suffer from lookig down for a rather long time in a very concentrated way. I really wonder, how long (non-stop) someone is able to work on it. Thanks for showing, Matti! Excellent photos, you can recognize every single detail! You had great visions and thoughts in Your comment. I am happy that You loved my post and photos. Therefore, our photography trip was not useless. 🙂 Thank You. Thank You for Your interesting comment. I appreciate it. 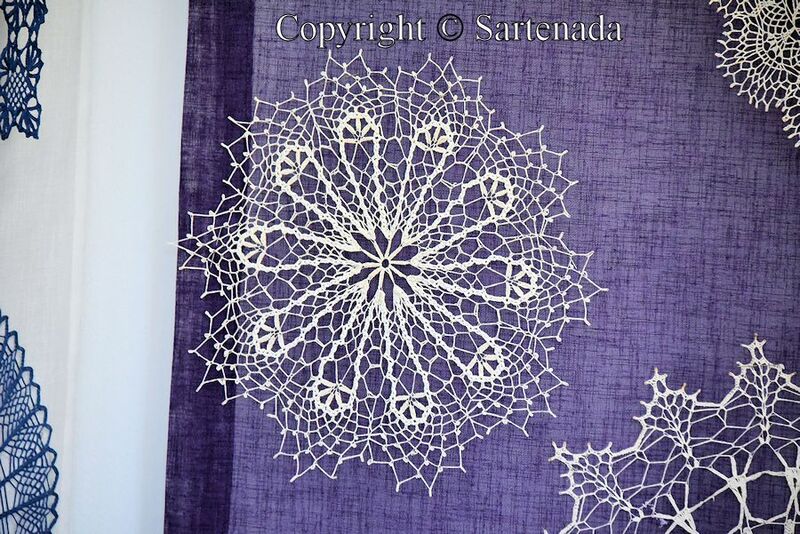 For those of you who may wonder at this “Reblog”…..my bloggy friend, and his photo-graphical eye has captured a wondrous world of artistry in thread that (I see) easily will enter my/the world of the quilt stitching process. 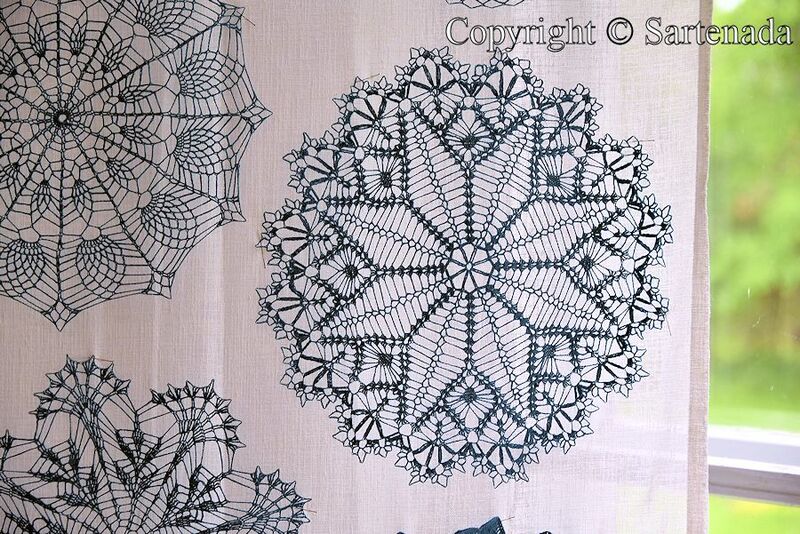 These “thread-flakes”, resembling “snowflakes”, are such a total wonder to view. Please, take a few moments to take it all in……………. Thank You Doreen. I appreciate it. Matti. I have to add……..this was a “MUST” Reblog!!!!!!! Thanks, again!!!!! How beautiful and different they all are. I can imagine difficult to do. She must have enjoyed doing it very much! That is so beautiful. 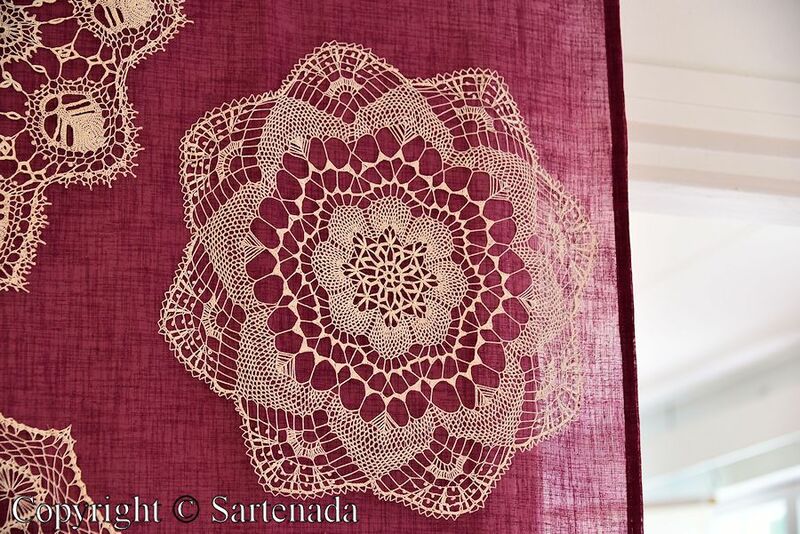 I have a table cloth my mother crocheted many years ago. It doesn’t fit any table we have but I can’t bear to part with it because I know how much work went into it and it was the work of her hands. 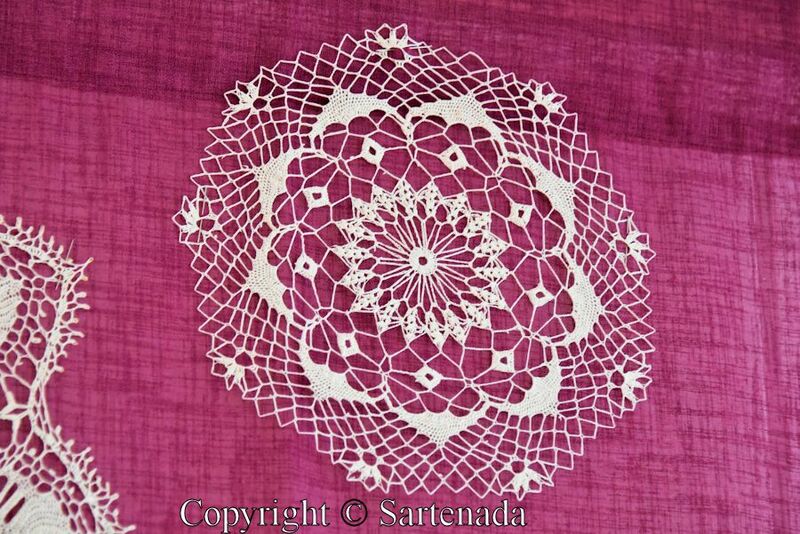 Crochets made by Your mother are so valuable, that they cannot be measured in money. Thank You commenting. What a fabulous collection! 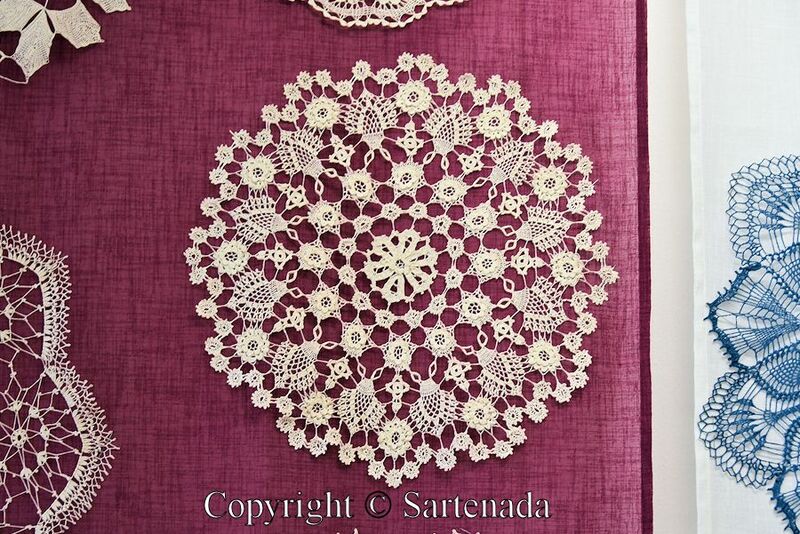 My Grandma did a lot of lace crocheting. I still hang the stars she made on our Christmas tree. Such a lovely reminder of her. 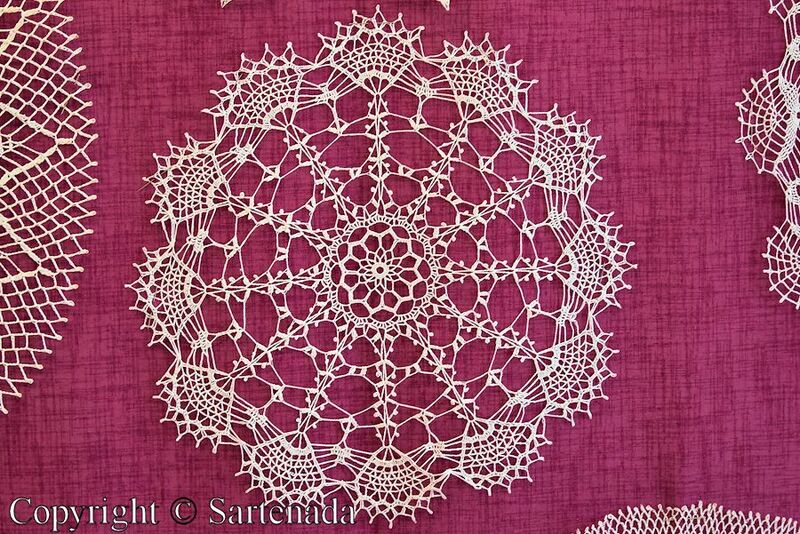 I am glad that You keep lace crochets made by Your mother yet today. They are so valuable, that they cannot be measured in money. Thank You. What beautiful works of art. I love how they are so simply displayed with the backdrops of color. You have reminded me today of my grandma. And that is a very good thing. Thank you for Your kind words. 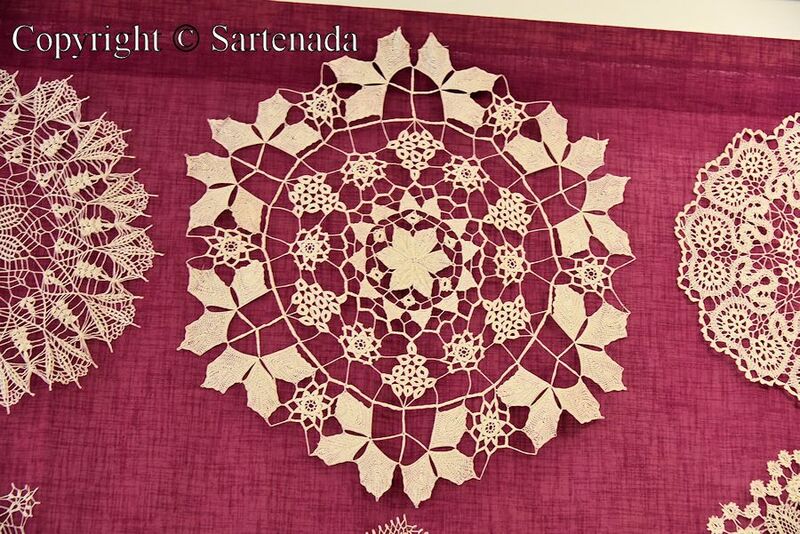 In my family, we have a pink crocheted bedcover in use, which my mother made. I am glad that You loved them. Thank You commenting. What an adorable collection! Your trip was worth its while and your photos are great. 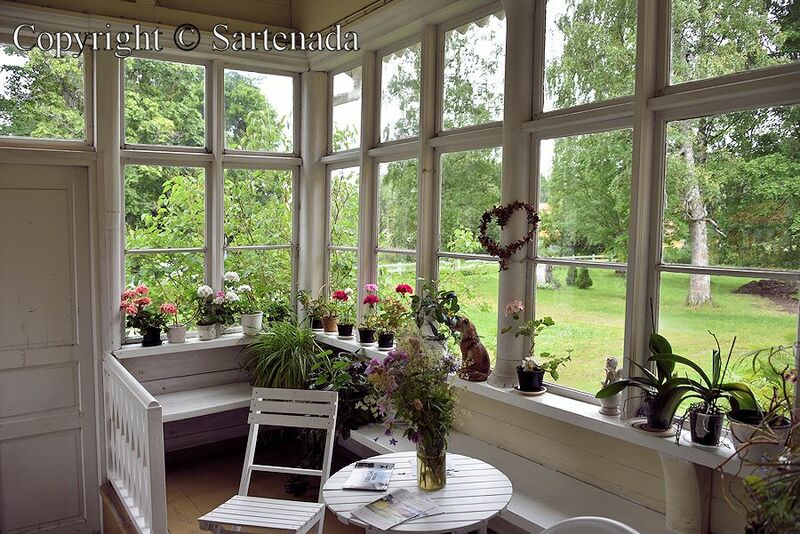 Thank you for this marvelous post, Matti! I am glad that You loved my photos and left Your kind comment. 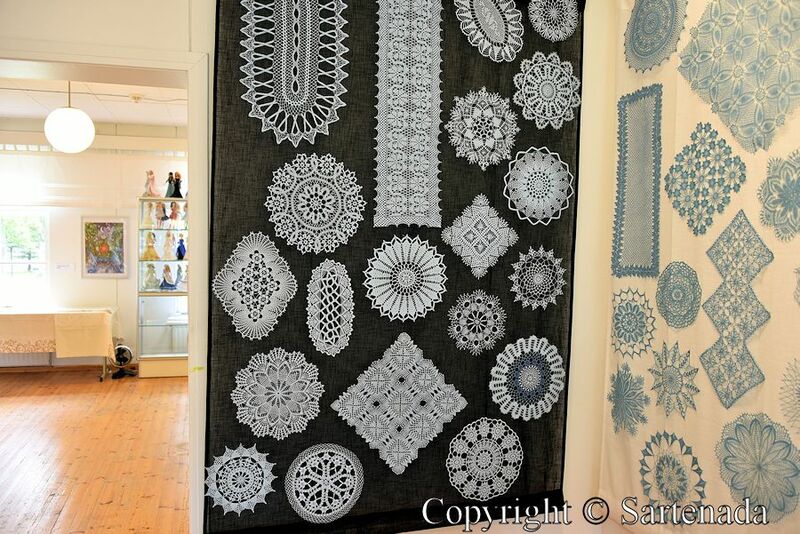 What beautiful and intricate pieces of art, like a collection of snowflakes! 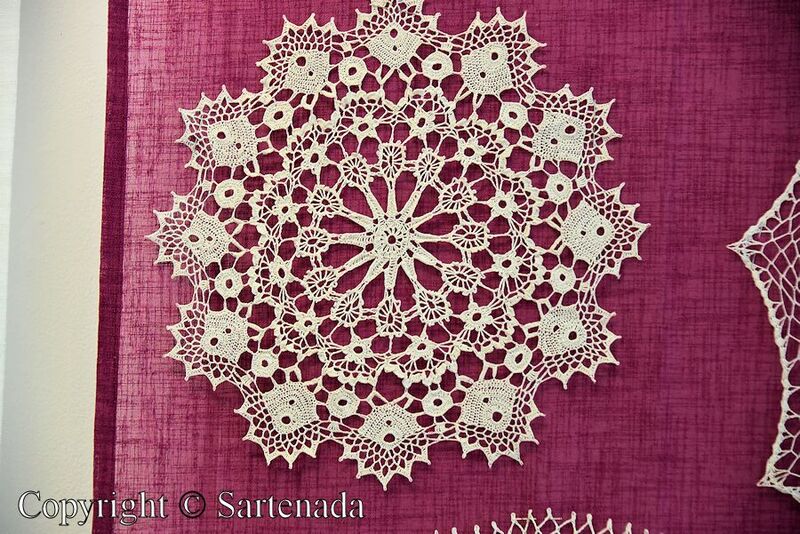 When I was a child, my mother did a lot of crochet and I was fascinated watching her do it. I never see it done here today. I am glad that You left Your comment. It seems that, in Finland there are yet some people, who are devoted to this. Thank You. Your title was very appropriate! 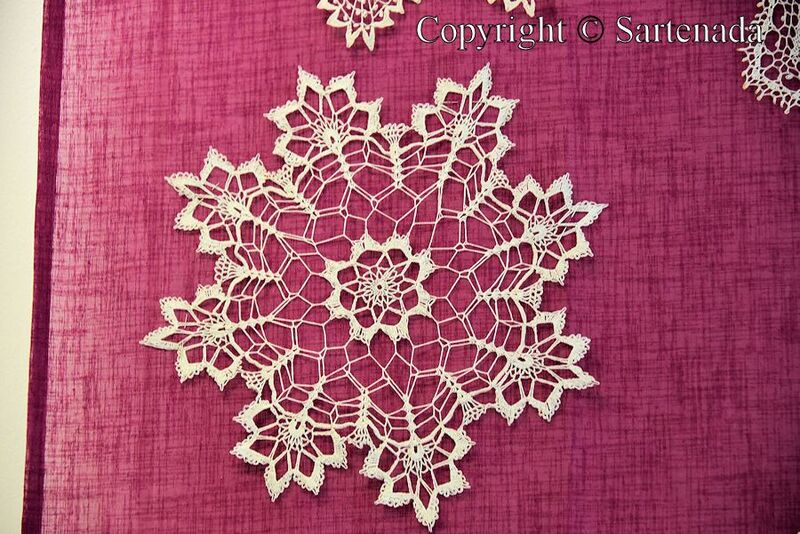 The tatted doilies remind me of the intricate variety in snowflakes! What an amazing amount of time,work and dedication! Great photographs, as usual! Happy to notice that You yet follow my blog and leave comments. Thank You. 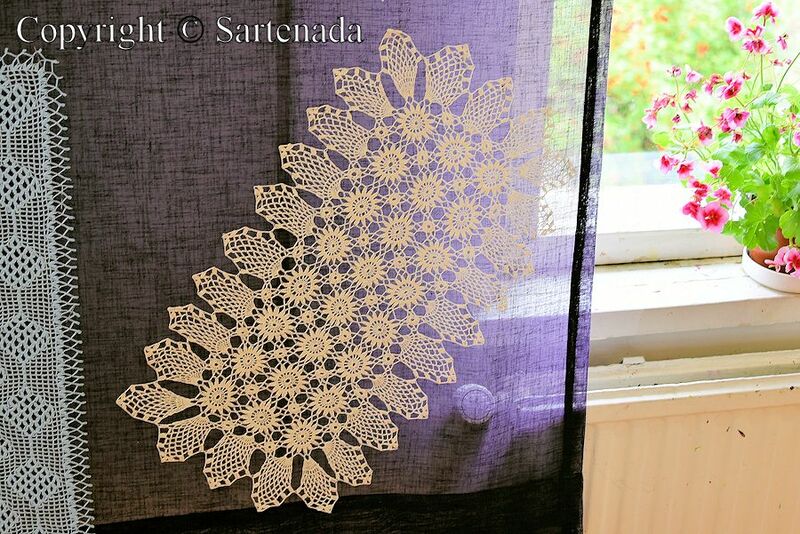 This was something incredible for me and my wife, who makes different handicrafts all the time, even sometimes while looking at TV. 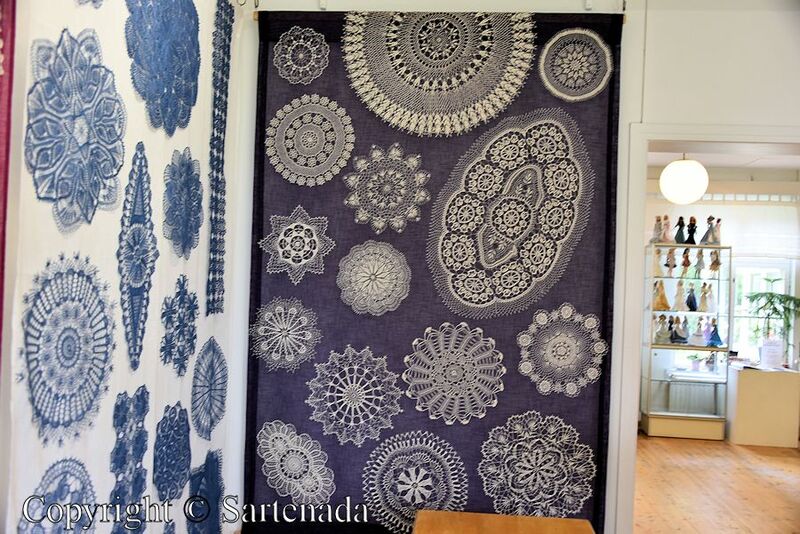 Una muestra estupenda y muchas ideas por los encajes que uno ya tiene en su casa…. Que te parece si los ponemos en los vidrios de las ventanas , en tiempo de Navidad? Bueno, estoy encantada con este post: magnifico! Obrigado pelo seu comentário! Uma feliz semana pra você! Thank You visiting my post and leaving Your comment. I am glad for it. 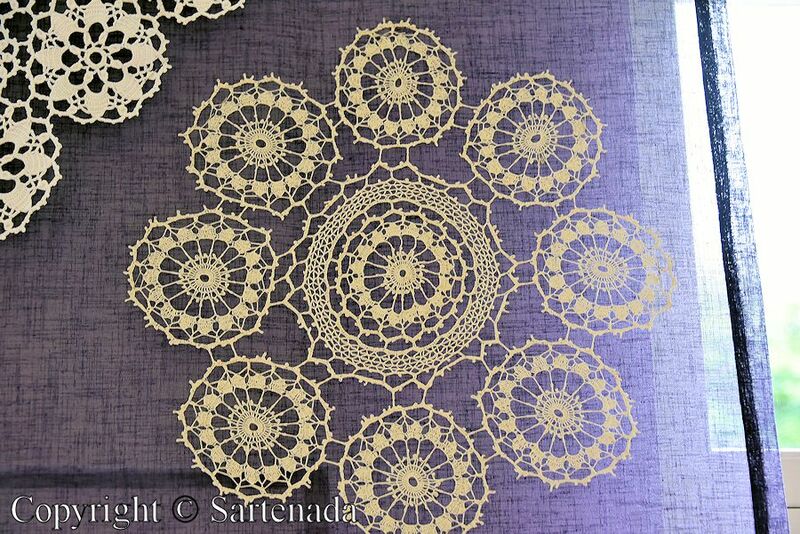 A very lovely collection, that you for sharing it with us Sartenada. 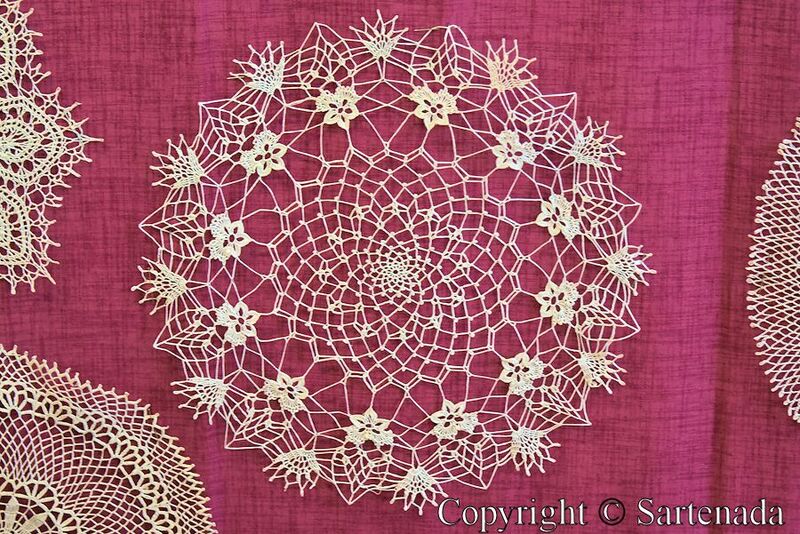 My grandmother used to crochet and I still have a few of her pieces. As a matter of fact I’m looking at one now that is next to my chair. Thank You for Your kind comment. 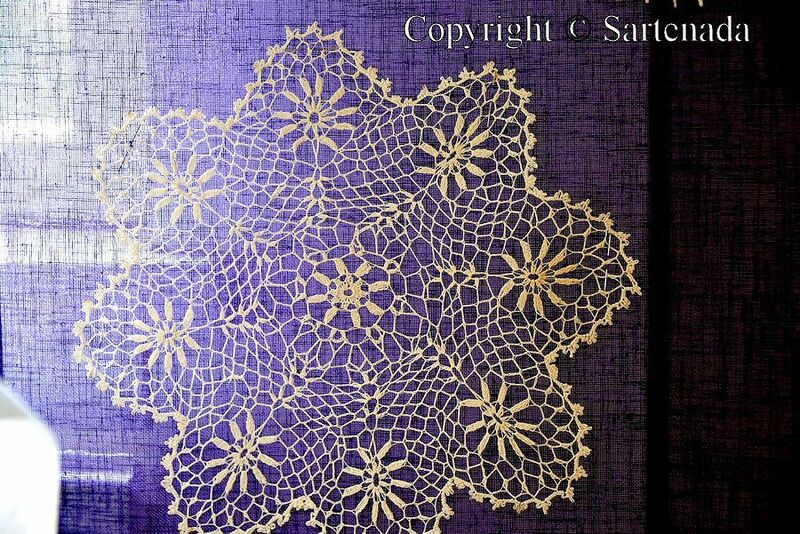 Glad to read that You still have some crochets made by Your grandmother. Their value cannot be calculated in money. How glad I am when reading Your kind comment. 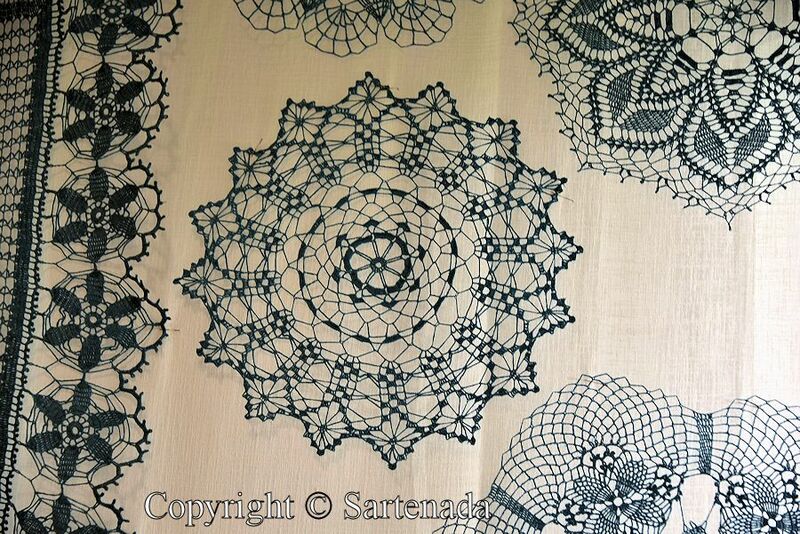 What an absolutely amazing collection of laces! I am very glad that You loved these. Thank You leaving Your nice comment. Wowowowow > What stunningly beautiful work > not to mention how gorgeous that house is. Thank You for Your praising comment and loving these. Thank You. I am very glad that You loved my photos. They are amazing Matti, and look very effective displayed in this way on those screens. Impossible to imagine that all of this has been produced in just eight years. Thank You for Your praising comment. She is incredible fast, this I saw in the video, in which she talks in Finnish and at same time makes laces. Thank you visiting my blog and leaving here Your comment. Oh, these are beautiful! Like some other people who have commented, I see a whole flurry of snowflakes, with each one slightly different. Thanks for sharing! Thank You again. Yes, You left Your kind comment on my About-me page. Encajes hechos a mano, una auténtica maravilla y una destreza que cuesta aprender. En mi región, (Galicia) hay mucha tradición de encaje. Frecuentemente disfruté de verlos hacer, (aquí se llama palillar) y es una auténtica pasada ver trabajar esas piezas. Mirando el resultado nunca imaginas lo costoso de la elaboración. Me alegra “calentar tu corazón”, que es una expresión preciosa. Efectivamente en Canarias confeccionan otros encajes, pero diferentes a los nuestros y también maravillosos. Muchas gracias. España es tan grande que las diferencias entre encajes de diferentes áreas es natural, lo creo. Me alegro de que Usted escribe en español, porque nunca he aprendido español en las escuelas, pero lo aprendí como un niño cuando trabajaba en Las Palmas, en 1969 sólo durante 4½ meses. Matti. Escribes estupendamente bien el español y tiene mucho más mérito si lo aprendiste hace tantos años trabajando en sólo 4 meses y medio. ¡ Eso es genial !. ¡ Enhorabuena! En Canarias se usa bastante el Vd., pero para un blog, que no es lenguaje formar y sobre todo conmigo, prefiero el Tú, por ser más cercano y para mi, más natural, aunque lo dejo a tu elección. Otro abrazo para ti y que tengan un día fantástico. Si, el Vos, lo utilizan mucho por la América hispano hablante. Thank You. I will visit Your site. 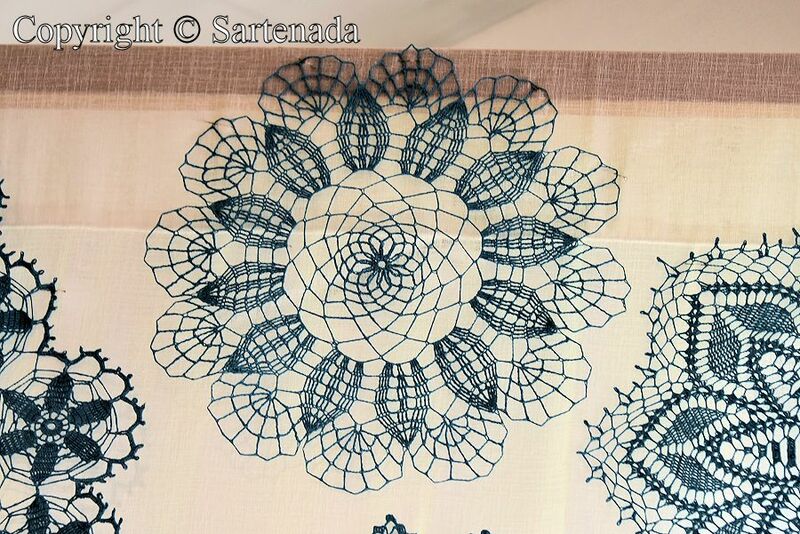 Quel plaisir de visiter à nouveau ton blog et d’y découvrir une si belle exposition de dentelles ! Des merveilles de talent, de patience et de finesse. J’admire beaucoup ! Merci. wow, Wow, WOW ! These are amazing! This lady is amazing! Thank You. Beautiful work. 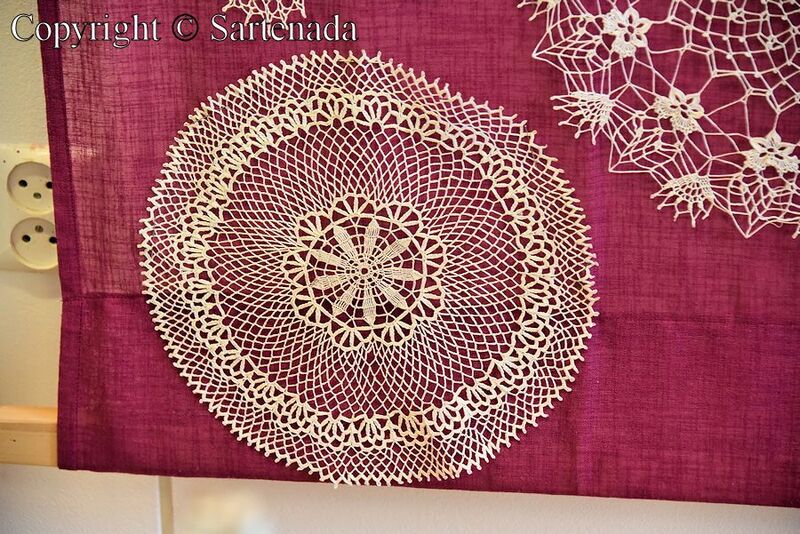 Delicate, intricate. Incredibly prolific. Thank You. I think that so huge amount made by one person is unique. Seeing it together as an exhibition I expect is very rare. 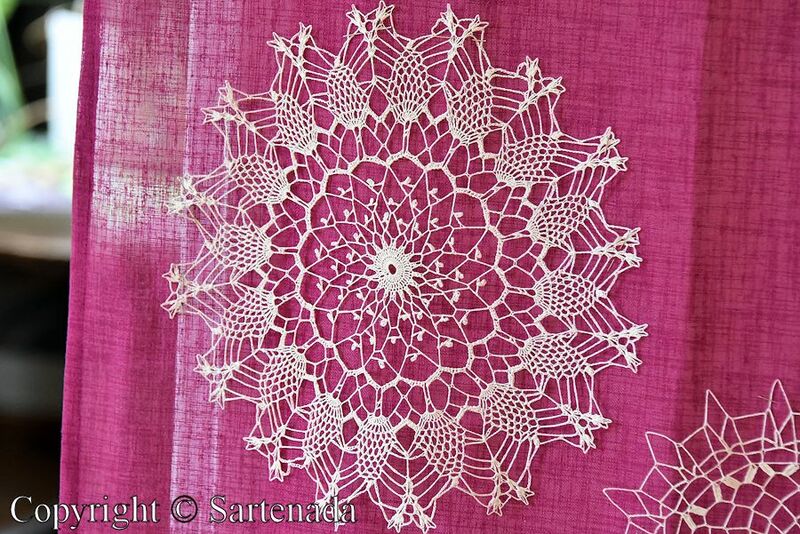 I think of the crochet work done by women in South East Asia – living in poverty, their work totally undervalued. They would never have the honour of seeing everything they have created in one place. I am sure that You are right. It is a pity that their works are not presented in blogs or in Internet generally. 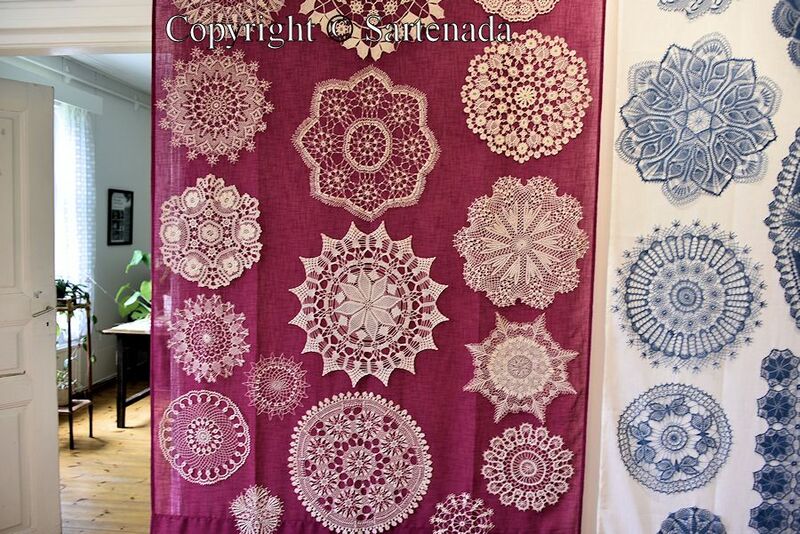 When I started this blog and I presented often my wife’s bead works and quilts, many visitor came from Central and South America. Apparently, they searched ideas from my blog. This lasted many years and slowly the amount of those visitors has decreased. Thank You.